This beautiful candleholder is handmade from leather stretched over a hand worked metal frame. 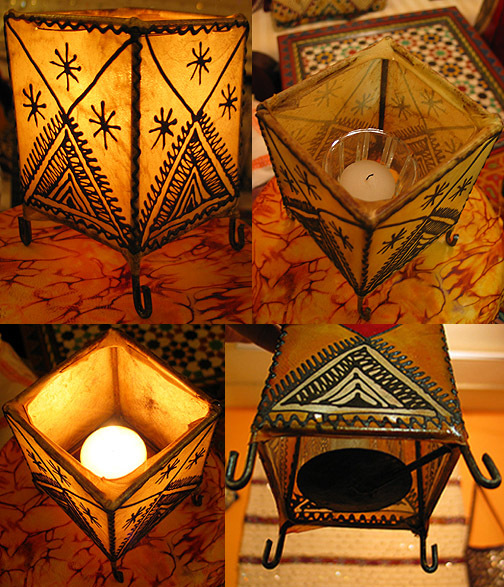 The leather is then handpainted with intricate henna (a natural plant dye) designs. This candleholder is a fabulous addition to any space whether it is a living room or a bed room or a hallway or bar or office. Use it with your favorite natural or scented small candles. Recommended to use candles in a small glass container that can sit on the billed on platform seen on image. Glass containers will keep wax in and prevent dripping or spilling on your furniture or floor. Use safely. If you like romance, here it is with this cute candleholder. Get few and add an exotic accent to your space and also save on shipping!